Info "Swing the boomerang into the air and catch it!" Boomerang! is one of Orbulon's microgames in WarioWare: Twisted! The purpose of the game is to tilt the system to throw the object and catch it as it flies back to the hand. 1st level difficulty: The boomerang has to be thrown and catch it. 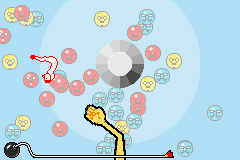 2nd level difficulty: There is now an object in the center and the boomerang is now a pickle, which has to be thrown a bit harder. 3rd level difficulty: The object is now bigger and the pickle is now a gymnast from Mario Paint, which has to be thrown really hard.